A hearty Vegetable Soup that’s packed full of vegetables! 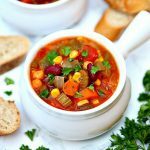 There’s nothing better than a warm bowl of soup on a chilly winter day and this hearty vegetable soup recipe is the best! Heat oil over medium heat in a large stockpot. Add carrots, onions, celery and green pepper to pot. Saute until crisp-tender. Add garlic and cook for an additional minute. Reduce heat and cover. Cook on low heat for 1 hour or until vegetable are tender. Refrigerate for up to 4 days. Freeze for up to 6 months.